Why did Stephen Hawking become so famous? What exactly brought world renown to Albert Einstein? Why are those particular individuals household names across the globe whilst other achievers are not; why have they become icons to rival film stars; and why they are adored and protected by a fiercely loyal fan base? 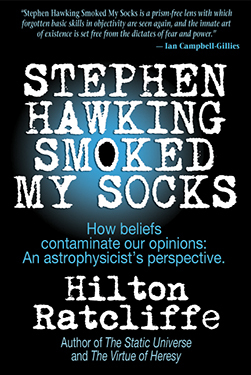 In Stephen Hawking Smoked My Socks, Hilton Ratcliffe seeks out the answers to those questions, and discovers that they have nothing at all to do with science. This book is about the power and influence of belief in creating our opinions, and the manifestations of polarizing conflict between belief and instinct in the development of our mindset. Ratcliffe does not write not write about his own scientific theories, or promote his personal models of the Universe. He is not proposing an alternative model of anything. Stephen Hawking Smoked My Socks humbly exposes the insidious control exercised by the scientific elite (of which he was once part), and offers instead a method of enquiry that favors objectivity in all our endeavors to illuminate truth. Examines Dr. Hawking’s career and what he achieved. Describes the empirical scientific method, exposing its inherent weaknesses and how its theoretical conclusions lead to the so-called standard models. Investigates the nature of belief and the influence of dogma. Illuminate the synergy between skepticism and pragmatism. Drills down into defensive social groups, including sects, gangs, cults, conspiracies, and the scientific elite. South African-born astrophysicist Hilton Ratcliffe has garnered respect amongst the global scientific community for his classical approach to space science: His belief system is based upon observation rather than esoteric theory, a reversal of the standard approach to cosmology. His first book, The Virtue of Heresy – Confessions of a Dissident Astronomer, is an international hit on its third edition. A measure of the esteem in which he is held is the invitation he received from iconic British astronomer Sir Patrick Moore, to collaborate on a second book, The Static Universe. His third book, Steven Hawking Smoked My Socks, will be released by U.S.-based Muse Harbor Publishing in November of 2014. Ratcliffe is a Durban-based physicist, mathematician, and astronomer. He is a member of both the Astronomical Society of Southern Africa (ASSA) and the Astronomical Society of the Pacific. He opposes the stranglehold that Big Bang theory has on astronomical research and funding, and to this end became a founding member of the Alternative Cosmology Group (an association of some 700 leading scientists from all corners of the globe), which conducted its inaugural international conference in Portugal in 2005. He was a member of the Conference Organising Committee for the Second Crisis in Cosmology Conference (CCC2) held in Port Angeles, Washington, in 2008, where he was also an invited speaker. Ratcliffe has been frequently interviewed in the press, on television and on radio, and has also authored a number of papers for scientific journals. Ratcliffe writes a monthly astrophysical column for Ndaba, newsletter of the Durban Centre of the Astronomical Society of Southern Africa, and edits the online newsletter of the Alternative Cosmology Group (ACG). He is best known in formal science as co-discoverer, together with eminent nuclear chemist Oliver Manuel and solar physicist Michael Mozina, of the CNO nuclear fusion cycle on the surface of the Sun, some 65 years after it was first predicted. In his capacity as a Fellow of the (British) Institute of Physics, he involves himself in addressing the decline in student interest in physical sciences at both high school and university level, and particularly likes to encourage the reading of books. Hilton gets more money from the sale when you buy his e-book from us. Substantially more. But we also understand that you might want your purchase to appear on your Kindle, Nook, or iPad without having to transfer files. That’s okay. We just want you to read the book. And it’s the exact same book, whether you buy it from us or not: the same DRM-free content, for the same price (unless you have a Muse Harbor coupon, in which case it’ll be cheaper. Shhh! Don’t tell the others). The only difference is that when you buy the e-book from Muse Harbor Publishing, more of the purchase price goes to Hilton, so that he can continue writing, and you can have more Muse Harbor books to read.